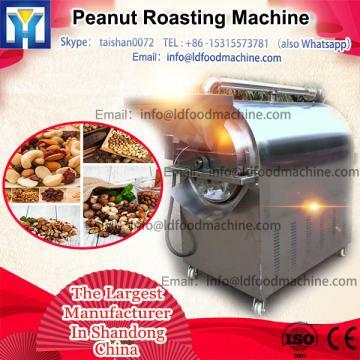 This kind of Peanut Roasting Machine Price is used to roast the peanut before peeling the red skin. After roasting, the peeling rate is high as well as the broken rate is under 5%. It is suitable for drying and roasting and applicable for various material: peanut, almond, cashew, cocoa bean, soy bean, sunflower seeds, etc. When roasting materials, you can also add some oil or salt to make different flavors. There are two heat supporting types: electric and gas type. You can choose the one you prefer. 1.It has adopted a unique roller horizontal structure, uniform heating, good sealing in the machine. The effects are particularly good for stew and fried. 2.The back cover can be opened. Maintenance and repair are convient. 5.Choose high quality asbestos for insulation materials, the performance of the insulation layer are good, it is high thermal efficiency. Tips: if thse types can not afford your requirements, please inform us and we can provide you the suitable one. 1. Energy saving and emission reduction/Bigger fire. About packing, for small size or single machine, we can offer international export standard packing, if needed, we can also equipped wood materials to help protect the machines. Or depend on your requirements. For the shipping, we have a professional shipping department. They will try their best to ensure your machine packing quality. After we signed the purchase contract and have a certain reputation guarantee, we will contact the professional group which is responsible for ship bookings, commodity inspection, commercial invoices, packing list, insurance policy and so on to provide you the perfect goods trading services until the product you purchased properly to your hands. Henan Machinery & Equipment Company Limited is manufacturer of machines with well-equiped testing equipment and strong technical force. We own import & export rights and mainly produces food machines and snack machines, especially for peanut roaster and drying machine. All the equipments have approved CE and ISO certification. Now, we integrade the research, development, production, and sale together. We welcome new and old customers from all walks of life to contact us for future business relationship and achieving mutual success! 1. How to control this machine ? A: you can adjust both temperature and roasting time according your need. The roasting temperature is up to 300°C. You can take out samples easily to check roasting condition so that you can control the way of every materials easily. 2. What can be used as the heat resource? A: we set gas and electricity as heat resource in the machine. If you need to use coal or wood, we can also design. 3. If do not know the ratio and roasting time, what should do ? A: we will send you kinds of ratio book and working video for free so that you can operate the machine easily.